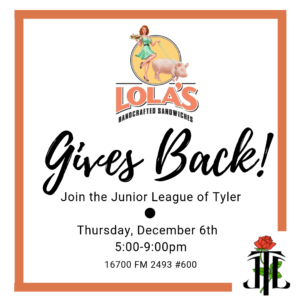 The Junior League of Tyler, Inc. is partnering with local restaurants for Give Back Nights. On these nights, a portion of proceeds will go to the Junior League of Tyler to be put to great use in the community. We look forward to dining with you at Potbelly Sandwich Works! 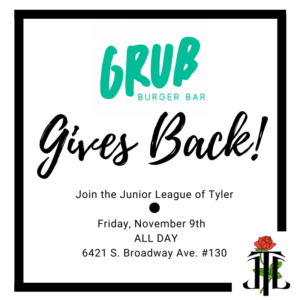 The Junior League of Tyler, Inc. is partnering with local restaurants for Give Back Nights. On these nights, a portion of proceeds will go to the Junior League of Tyler to be put to great use in the community. We look forward to dining with you at Lola’s Handcrafted Sandwiches! We are elated to invite all 6th grade girls to participate in Junior League of Tyler’s annual Girl Power Summit. This is a FREE event! 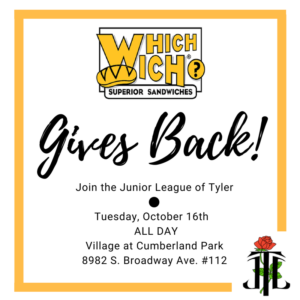 What: The mission of the Junior League of Tyler Girl Power Summit is to equip 6th grade girls in the Tyler community with the tools necessary to bloom into successful, empowered, civically-engaged women. 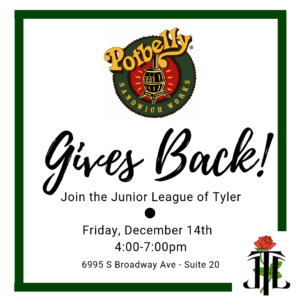 Highlights: This single day event will provide an opportunity for young women in the Tyler community to develop healthy habits through interactive activities with community leaders and Junior League volunteers. The program will highlight four pillars of success: self-value, education, civic engagement, and future planning. 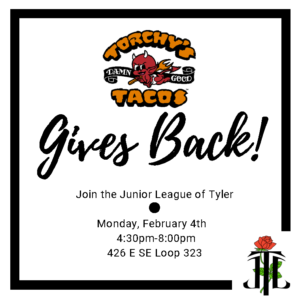 Service Project: Participants will have the ability to participate in a service project for a local Tyler Fire Department. If interested, girls can bring a bottle of water or Gatorade to the event! Additional details about Touch A Truck 2019 coming soon! This year’s Summer Reading Camp will be held June 18th – 22nd. Campers will be entering the third grade at various TISD schools this fall. The Junior League brings an excitement to reading through crazy-fun sessions in Art, Drama, and Community. One of the many highlights of camp is the daily visit to the camp bookstore. Each camper leaves with many wonderful memories and also with at least 25 new books, including our own Good Night Rose City. The Junior League of Tyler believes that an excited reader becomes a strong reader and a strong reader becomes a strong learner! We love reading; please join us!!! Save the date for our 2019 Mistletoe & Magic holiday gift market— December 4-7. 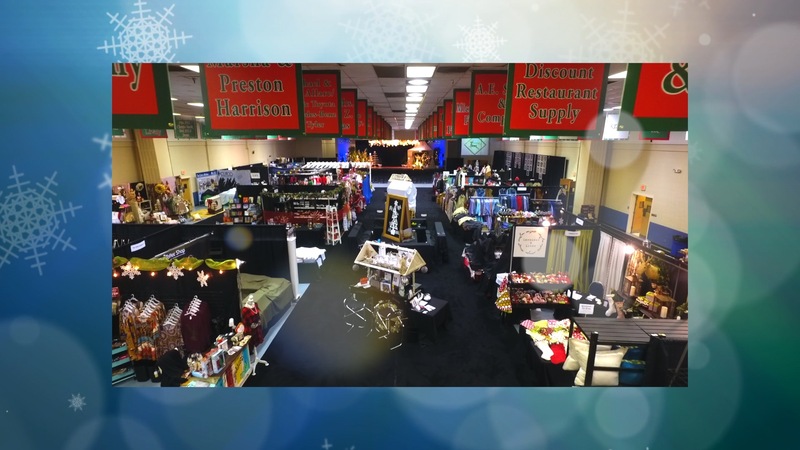 Mistletoe & Magic is a four-day shopping extravaganza held at Harvey Convention Center in Tyler. This holiday market is a collection of more than 90 specialty boutiques and merchants from all over the country showcasing antiques, artwork, gourmet foods, jewelry, seasonal decorations, housewares, adult and children’s clothing and much more. The weekend-long event is also host to brunches, style shows, musical entertainment and so much more! 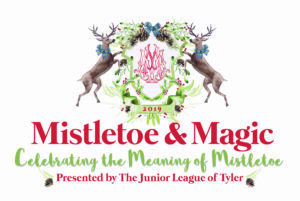 As one of the Junior League of Tyler Inc.’s largest fundraisers, Mistletoe & Magic raises crucial funds that help financially support local non-profit agencies and community programs. Want to know more about what to expect? Check out our video for just a glimpse of what Mistletoe & Magic has to offer.